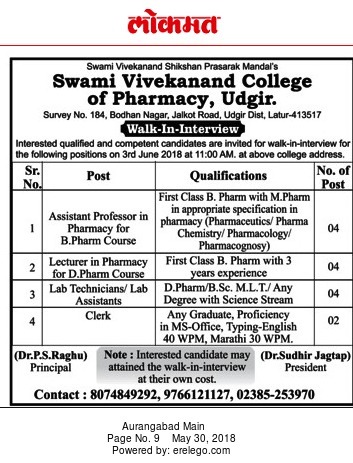 Swami Vivekanand College of Pharmacy, Udgir has advertised in Lokmat newspaper for the recruitment of Assistant Professor plus Lecturer job vacancies. Interested and eligible job aspirants are requested to appear walk in 3rd June 2018. Check out further more details below. About College: The Swami Vivekanand College of Pharmacy, Udgir is going to establish by the Swami Vivekanand Shikshan Prasarak Mandal, Udgir in 2018-19. The institute is going to start two Pharma courses namely, D-Pharmacy* and B-Pharmacy* from the academic year 2018-19 respectively.